I’ve crossed off another item crossed off the transit-related bucket list. It was a test of keeping awake and staying warm. At times, I was questioning my sanity. 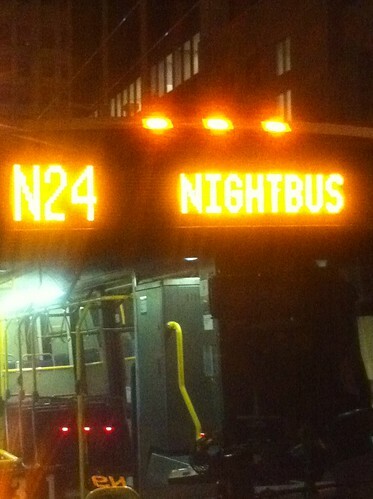 But I survived an epic journey to the fringes of the NightBus network. TransLink’s NightBus is a network of 12 routes [map*] that mimic their daytime counterparts and/or the SkyTrain lines they parallel (in the case of the N9, N10/N15, and N19). They all leave at about the same time (usually 02:09, 02:39, and 03:09) from a common terminus on Howe Street between Pender and Dunsmuir. 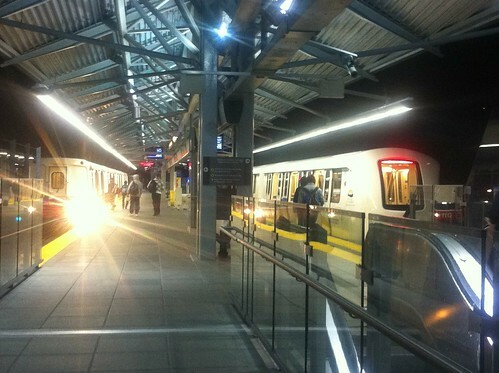 On this particular night, I started by taking one of the last SkyTrains to Surrey Central. By this point, the maintenance “speeders” were already using the westbound track for their shifts checking to make sure the system is in order. Maybe because it was a weeknight, but the train ride and the Surrey Central bus loop were actually sedate. When the N19 going downtown did not show up before its scheduled departure, I panicked a bit; at this point, I had no way back home except for taxis. Luckily, it did show up, and after the driver had a chat with a supervisor, off we went. I can see why the driver could be a few minutes behind: little traffic and few passengers made for a very speedy trip over the Pattullo Bridge (a rarity for an in-service bus, thanks to SkyTrain), through New West, and on Kingsway all the way downtown. The N19 arrived downtown a bit early, so I had to wait a little longer to connect to the N9 heading to Coquitlam. Fortunately, the driver allowed me and other passengers to avoid getting cold. Just like on the ride in from Surrey, this was a quiet and quick trip. I can imagine it won’t be like that on a Friday or Saturday night! By the time the bus was heading down the homestretch along Guildford Way, I was the last one aboard. I was then let off at Coquitlam Station about 15 minutes ahead of its scheduled arrival. The beauty of the schedule (and hence the viability of such a trip) is that I can wait here until the first 97 B-Line of the day departs at 04:37. (This trip can only work late Sunday to Thursday for this reason.) It’s amazing how still and quiet it can be at four in the morning. I saw the fog rolling in as I wandered the Coquitlam Station bus loop and park-and-ride, trying to keep warm. I noticed that that morning’s papers were already in their boxes. It was weird, as I was technically still thinking in terms of the previous day. From Lougheed, I ultimately made my way home. All in all, it took five hours from start to finish. Once home, I promptly collapsed on my bed and slept it off. Needless to say, I didn’t do much the rest of the day once I got up. It’s been a few days now, and I thought there would be some massive disturbance in my sleep pattern, but I’m glad to say that there haven’t been any. * I scanned the map from the latest transit system guide, which is now free. I can’t seem to find a proper, standalone version from the TransLink site.